White offers a neutral backdrop to introduce traditional elements into a modern aesthetic. 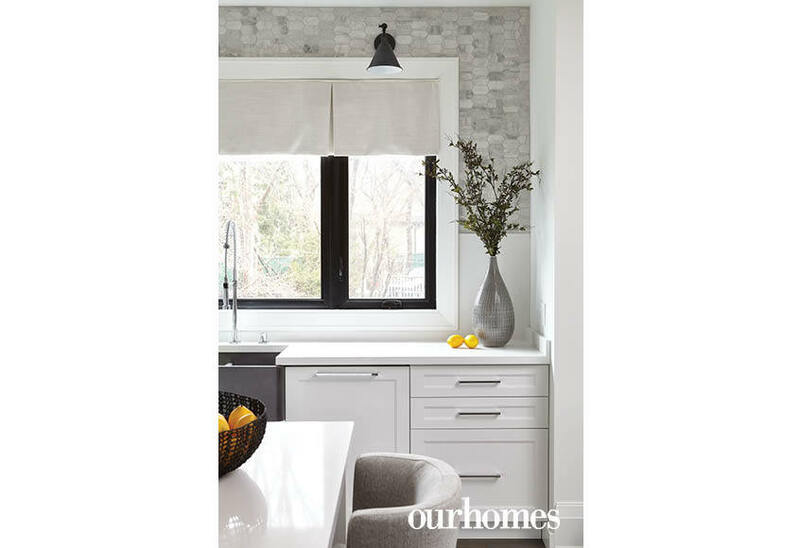 A version of this article originally appeared in the Fall 2018 issue of OUR HOMES The City of Toronto, p.78. 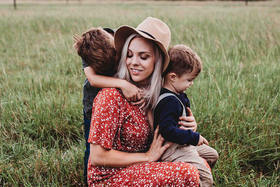 Find local businesses in our Toronto-York Region directory. Nunus Molu and her husband Saj had found the ideal location for a home in the Kingsway area of Etobicoke. 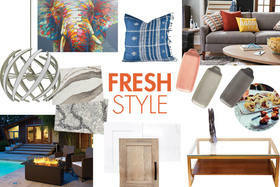 While Nunus was looking for a modern aesthetic, Saj leaned toward the more traditional. 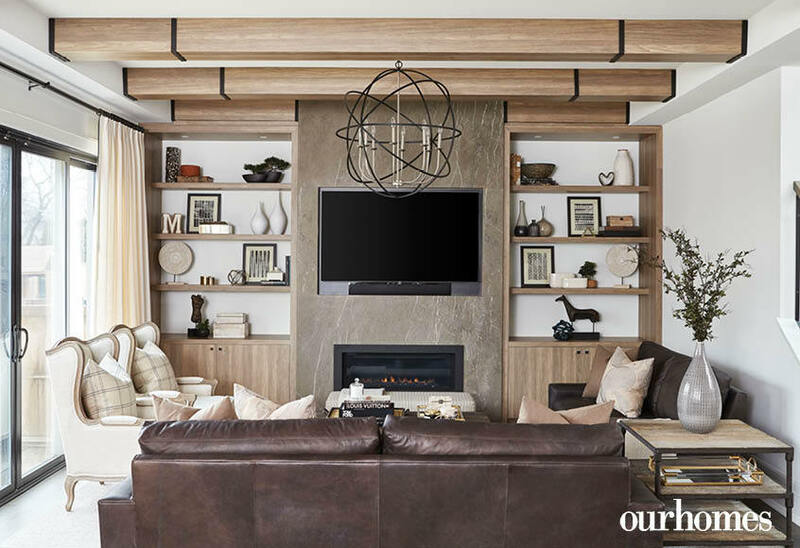 They enlisted Designtheory designers Leanne Tammaro and Adolphina Karachok to achieve their custom build. 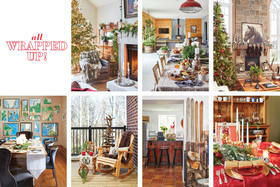 “They wanted a bright, white home that still felt warm and livable. 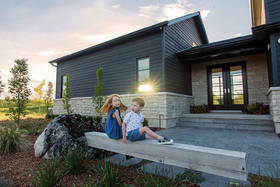 Their previous home was quite dark, with heavier traditional elements and finishes,” says Leanne. The result: Wall panels and ceiling details, against an all-white backdrop. In the dining room, the designers introduced a cofferred ceiling. Recessed panels painted a creamier shade of white layer the space. Living and dining room windows are white to balance the homeowners’ pre-existing furniture and the coffered ceiling, but elsewhere in the house, window trims are painted in black. Wood elements break up the all-white palette. 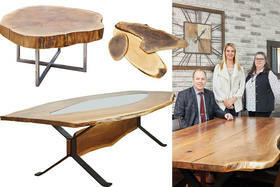 Custom wood beams run through the kitchen to the family room, and the same veneer appears in the family room millwork. In the master suite they maintain warmth by introducing wood elements. The vanity design features face-framed cabinet doors installed with the grain on a 45-degree angle to create a chevron pattern. 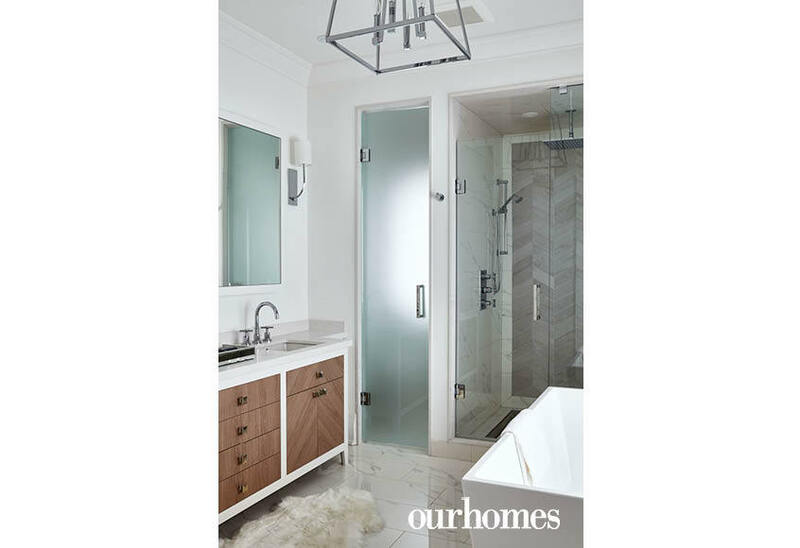 Porcelain tile with a wood-like texture in the shower repeats the chevron pattern. 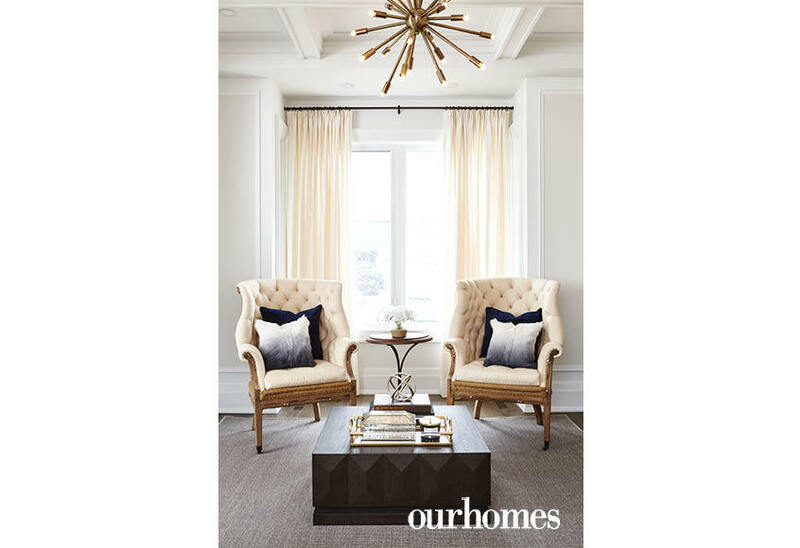 Design elements such as black accents and the use of the same draperies in each of the main living spaces come together to create a unified home. 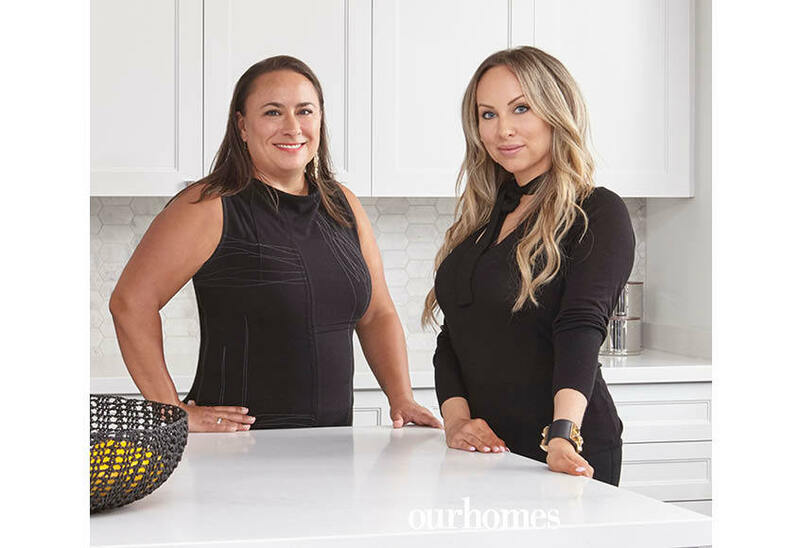 Leanne Tammaro and Adolphina Karachok of Designtheory. The dining room’s coffered ceiling creates a more formal, traditional feel. Wood bookcases complement the ceiling beams and continue the look from the kitchen through to the family room. A marble slab backs the television wall and the designers kept the shelf backing white, which softens the feel. A spectacular marble slab fireplace surround is a focal point in the family room. 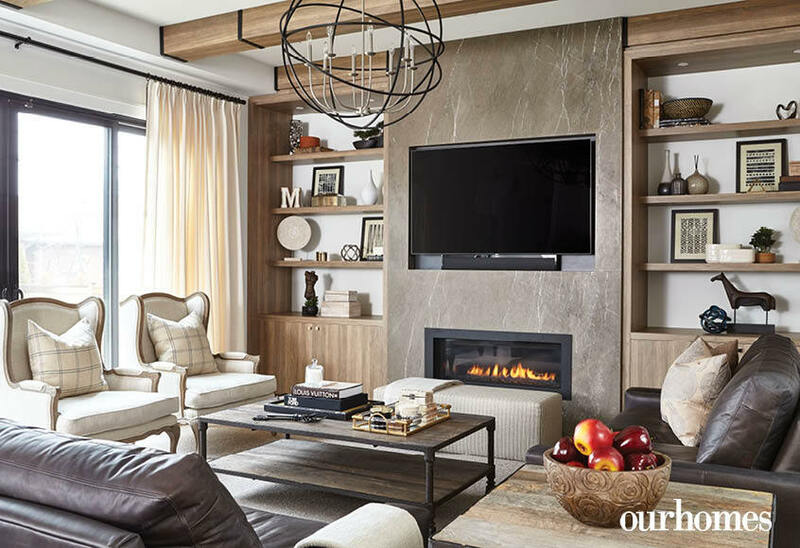 The custom built-ins blend seamlessly with wood beams in the family room. 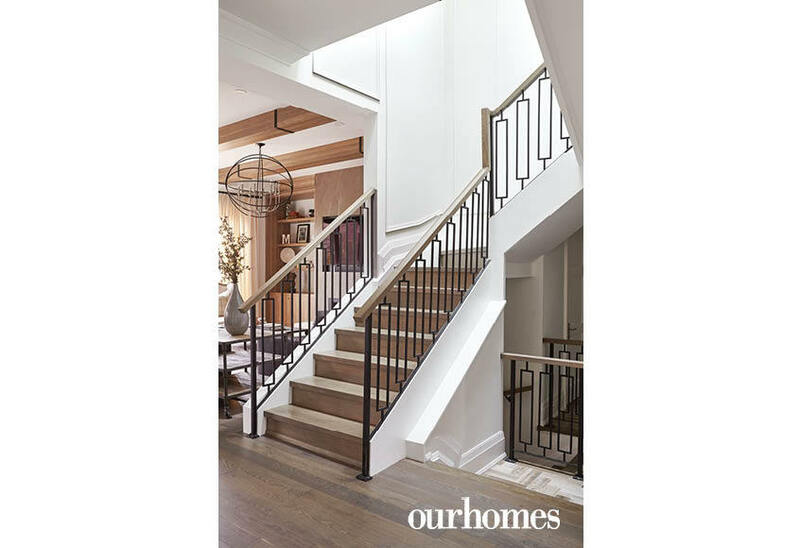 The staircase is transitional with a blend of metal and wood. 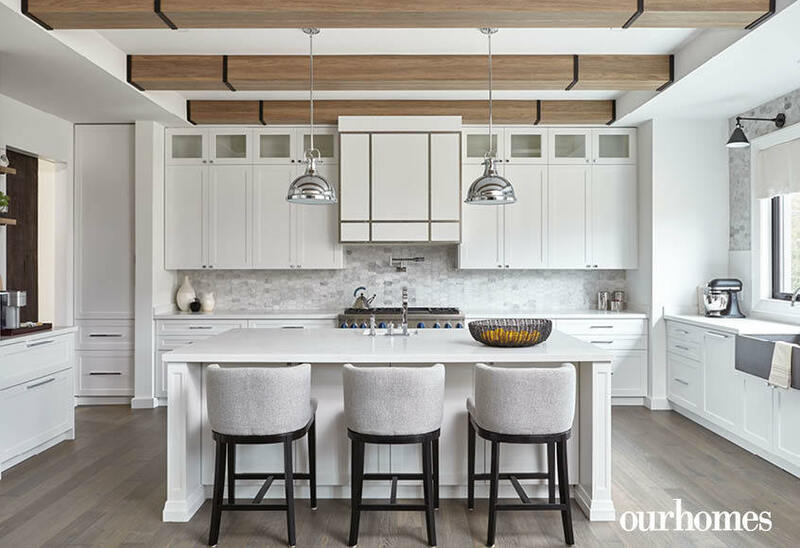 Wood beams soften the all-white kitchen. 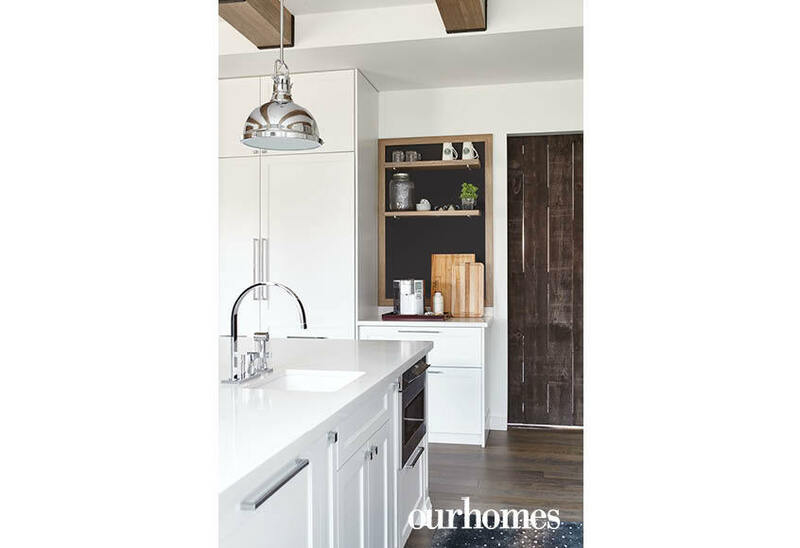 A metal-edged range hood offers a modern element while curves in the backsplash soften the look. Tiling the wall from top to bottom adds dimension. 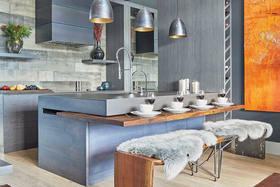 The addition of metal in the lighting and hardware creates balance. 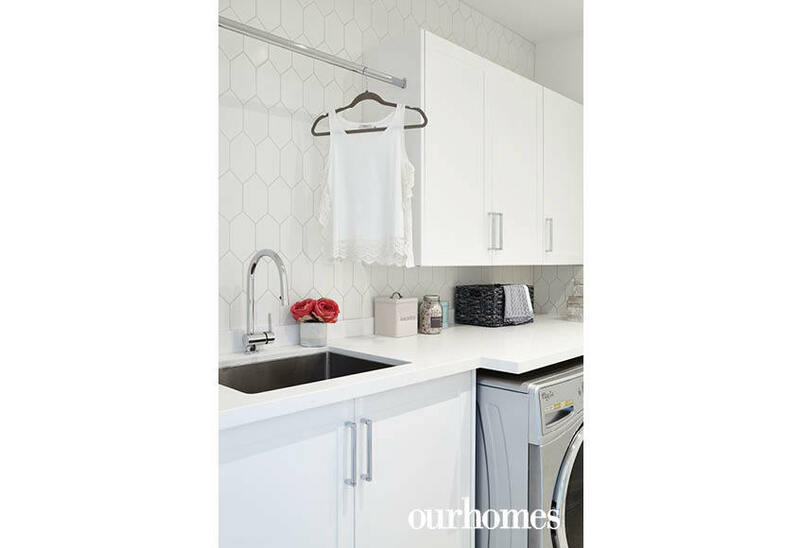 A textured wall makes the laundry room fun and functional. 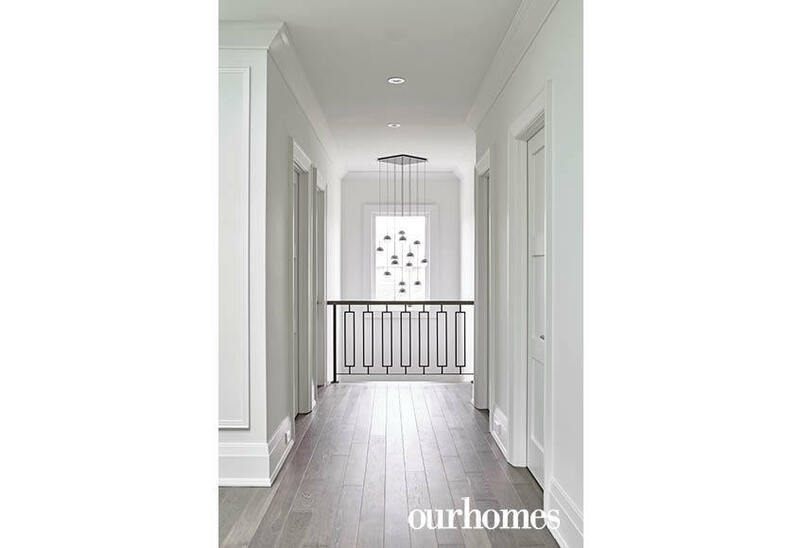 A contemporary lighting piece is perfectly placed in the upper hall. 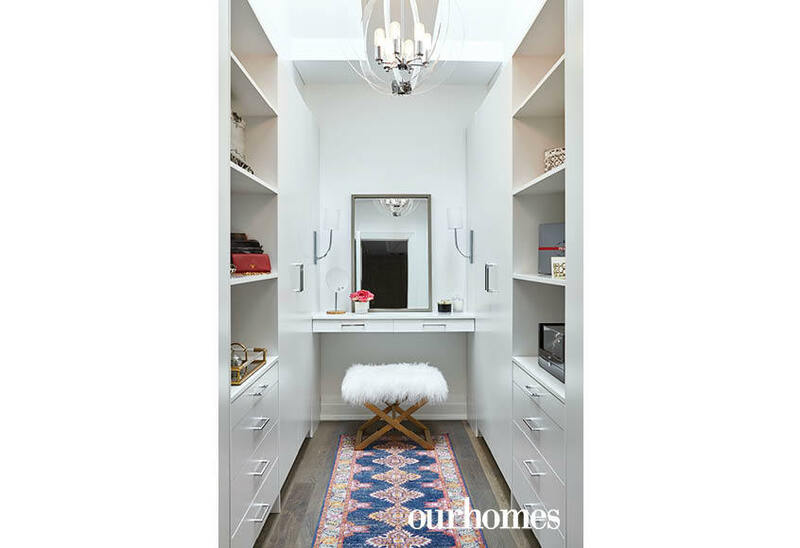 A boutique-style custom walk-in closet and vanity invites pampering. 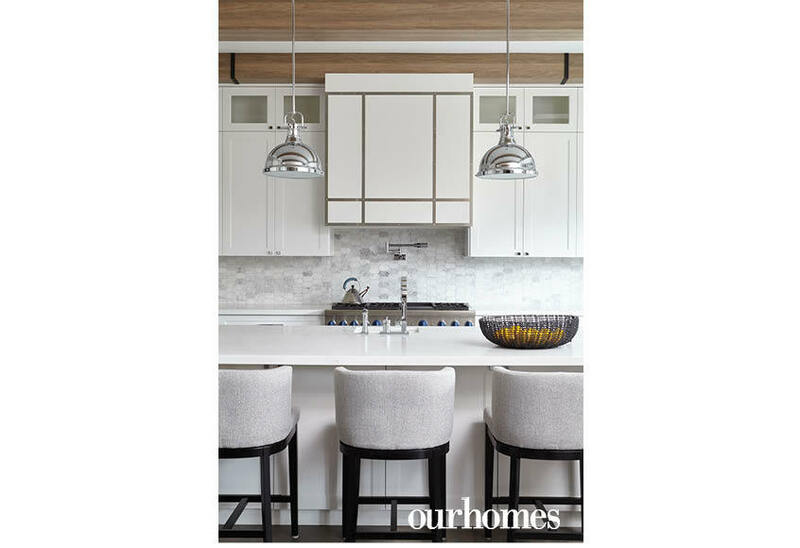 Face-framed cabinetry is sleek and streamlined in the master bath. Tiled and sophisticated, textures balance out the white master bathroom.